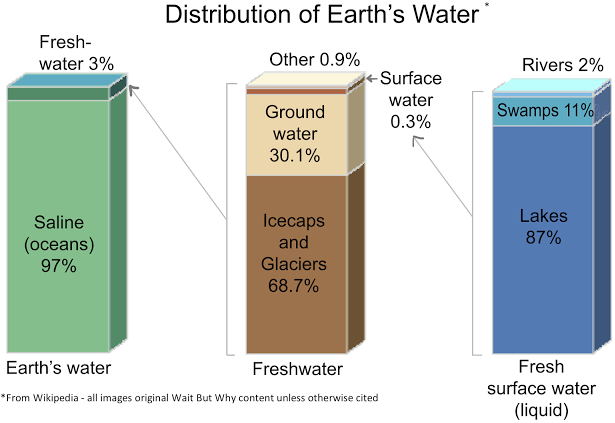 I was researching something about evolution for one of my grade 9 classes the other day when I stumbled across this series of infographics about water resources. We’ve just begun our exploration of Topic 2 – Ecosystems, but these infographics do a really nice job of putting the amount of water on our planet into perspective. You can click on this link for the original post at waitbutwhy.com. We will revisit these images when we dive into Topic 3, Subtopic 3.6 – Water Resources (‘dive in’ – get it? haha! ), but they’re worth a read now. You’ll need to know some of these numbers for your IB Exam! This entry was posted in Environmental Systems and tagged cool stuff, ESS, glaciers, lakes, oceans, resources, rivers, Topic 3, water. Bookmark the permalink.